You can grow almost anything in a container. A simple potted basil plant could be considered a container garden, but there are so many other possibilities. Gardening in pots and containers gives you the ability to ensure great soil, ​experiment with color, move your garden with the sun, and raise your garden to a comfortable working height. Maybe the best feature of container gardening is the ability to create a whole new garden every time. Here are some tips for success. 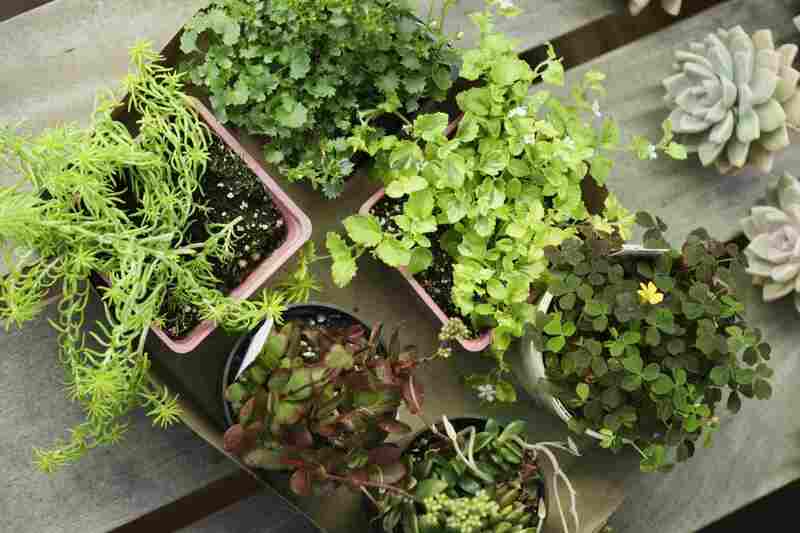 Make sure there is enough room in the container for the plants and soil. Take into account the mature size of the plants and their growing habits. Upright growers will need a wide base for balance. Sprawlers will need a pot deep enough to drape over. As the plants grow, the root systems will fill the pot and the soil will dry more quickly. It's OK to fill the diameter of the container with plants, but make sure there is plenty of room for the roots to move down into the soil. Always have drainage holes, or at the very least, a 1- to 2-inch layer of gravel at the bottom of the container. If you are using a decorative pot without drainage holes, consider planting in a plastic pot with holes that are one size smaller than the decorative pot and ​using a plastic pot as an insert. Use a good potting soil mix, not garden soil. A mix with peat, perlite or vermiculite will retain moisture longer and yet be well draining. It will also be lighter and won't compact as the season goes on. Using a chunky-style potting mix in containers of 5 or more gallons will help the soil mix remain loose even longer. In a garden bed, you can select which plants need water and which to pass over. Not so with a container garden. When one gets water, they all get water. Select plants that will be happy with the same amounts of water, sun, heat, and food. Avoid aggressive spreaders that will compete with neighboring plants, and consider dwarf varieties. Most container gardens are going to require daily watering in hot weather. Even so, there will be times when your potted plants are going to be baking in the sun. Give your container a fighting chance by favoring plants that can handle the intensified heat and dry soil of a container garden. Container gardens look best when the plants are in balance with the container. Try to make sure your tallest plants are not more than twice the height of the container and that the fullness of the plant material is not more than half the width again as wide. Try not to sit containers in full midday sun. You may have chosen plants that say they require full sun, but container gardens heat up much more quickly and intensely than ground gardens. Most plants will welcome some relief from the midday sun. On the other hand, when you must position a container in the shade, consider putting it ​on a wall that can reflect some light back. The plants won't suffer from the extreme heat, but they will benefit from indirect light. Lack of water can quickly kill plants in a container garden. Unlike plants grown in the ground, container plant roots can't move down deeply in search of subsurface water. Check your containers daily for water needs. Check twice daily in the heat of summer and with smaller containers. Some potting mixes come with fertilizer already mixed in. Some don't. Either way, container plant roots can't spread out looking for additional food in the soil nearby, so you will need to replenish soil nutrients regularly. Good choices are a time-released fertilizer mixed in when planting or a water-soluble fertilizer every 2-4 weeks. Don't be afraid to switch out plant material for the change of season. No plant can go on blooming forever. When one plant starts to fade, look for another to take its place. This way you can start your container garden in the spring and go until frost (longer in warmer climates). With container gardens, the sequence of bloom is entirely within the gardener's control.